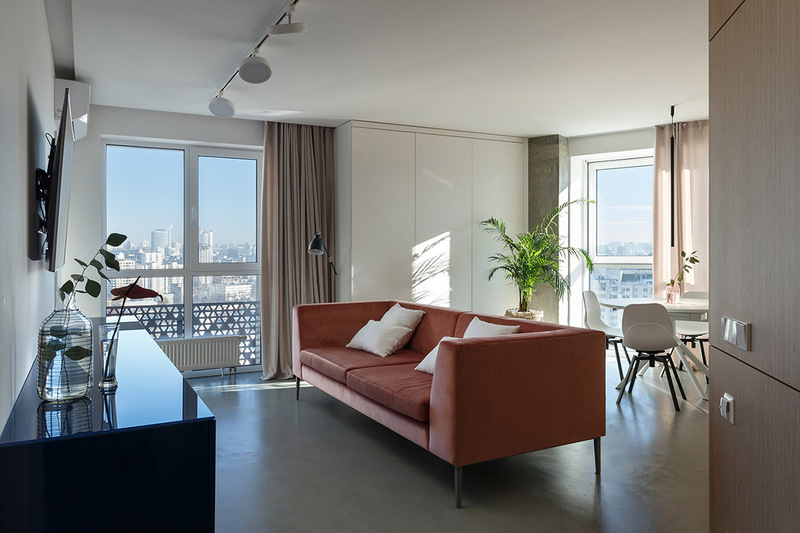 Daybreak and sunbeams were the muse for this warm apartment design, entitled ‘Miracle Morning’ by Svoya Studio. 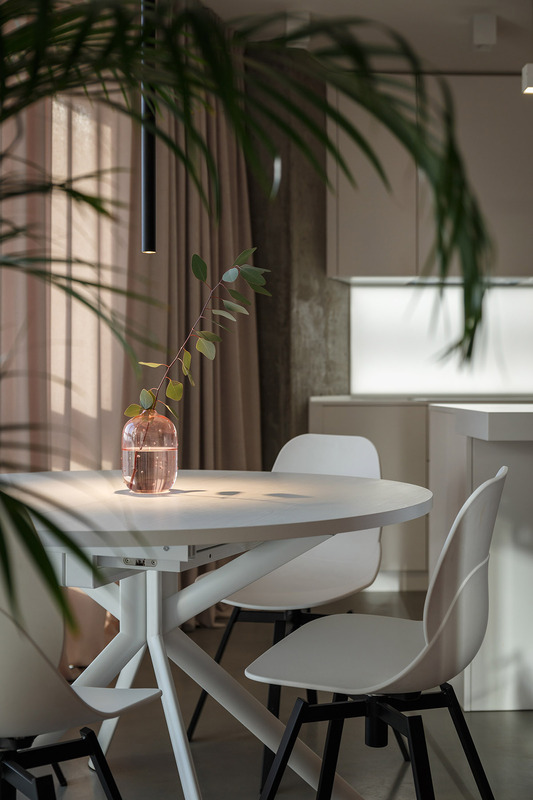 The team focussed on the idea of morning being the most special period of the day, and ensured that the sun appeared in many elements of the apartment. 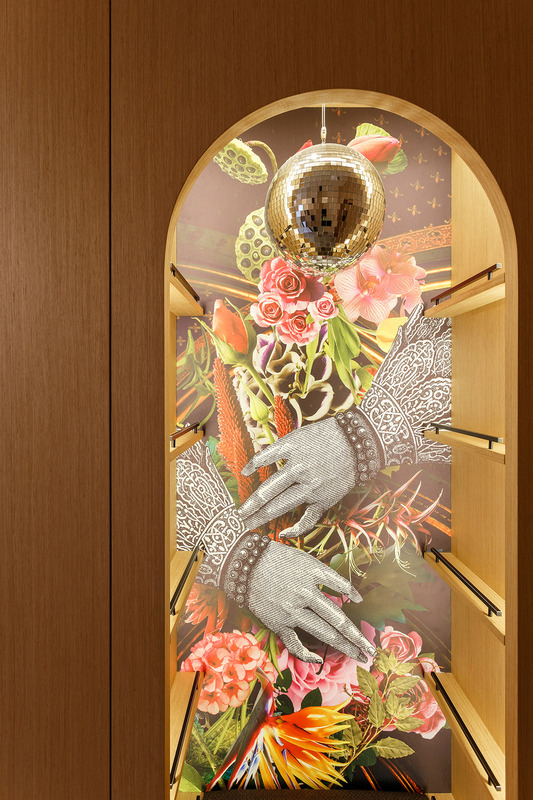 Even in the small entrance hall–though it is isolated from natural light–has a mirror ball to shine ‘sunbeams’ around. 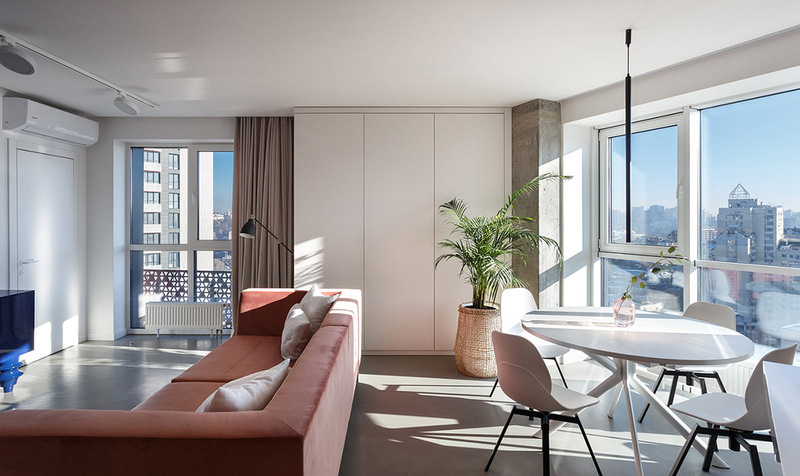 The warm hues of dawn colour the apartment, inspired by the sunrise that can be observed in its glory through the large windows in the flat; concrete floors span out toward the grey cityscape. A bespoke bed in the master room is positioned to face out to morning’s first light. 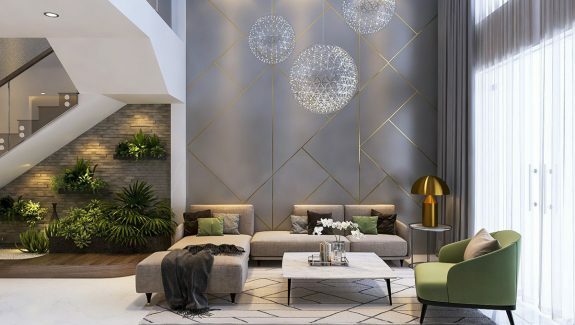 A modern sofa has been positioned across the open plan living room in order to divide the lounge from a kitchen diner. 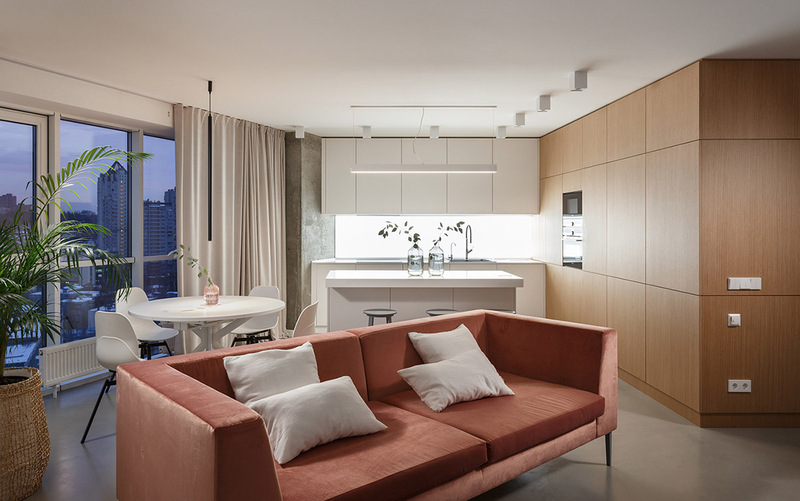 The sofa is upholstered in a sunrise orange fabric; white scatter cushions coordinate with the white kitchen cabinets and dining set behind. 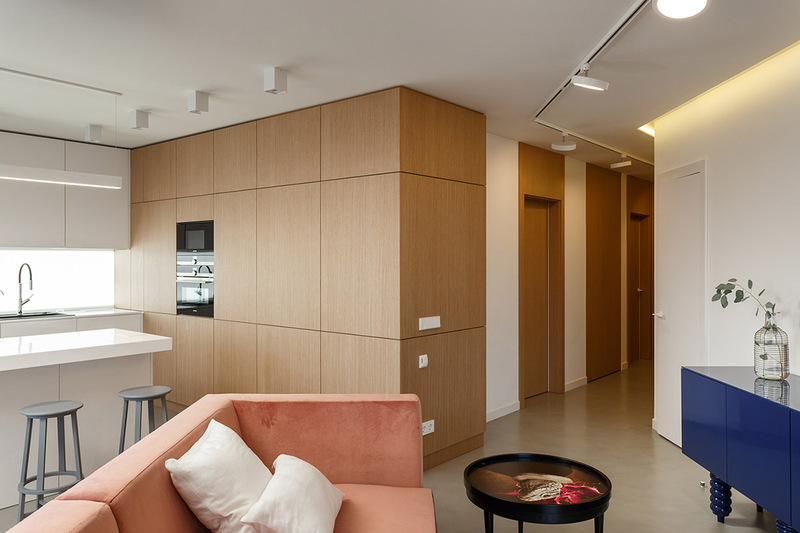 A row of tall storage units travel a length of wall between the living room dining room combo. 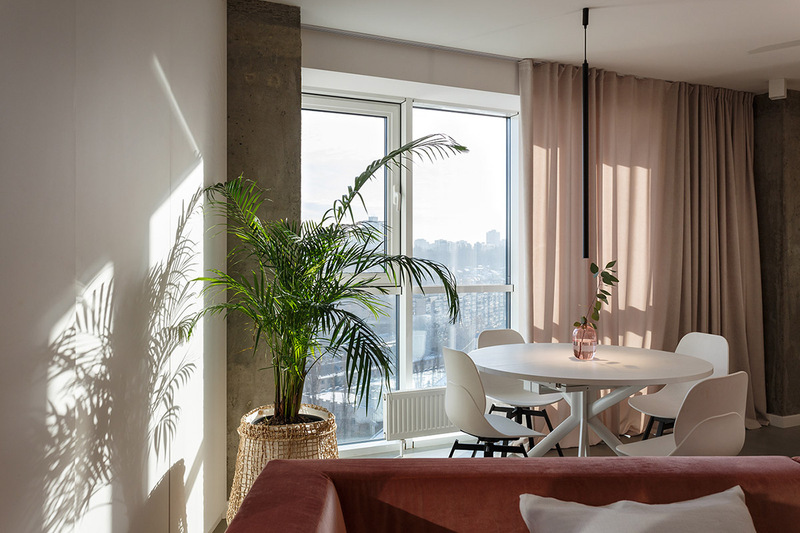 The remainder of wall space is occupied by windows that bring in copious amounts of natural light, which spills over furniture and floor. 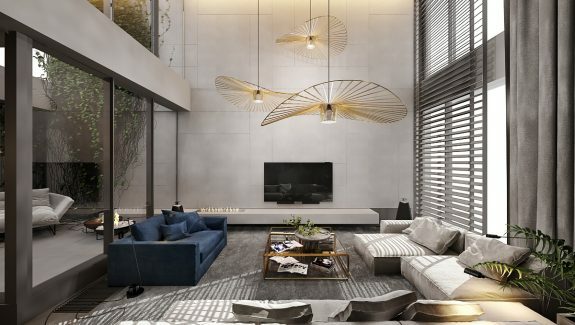 The polished concrete floor nods to the concrete jungle beyond the glass. 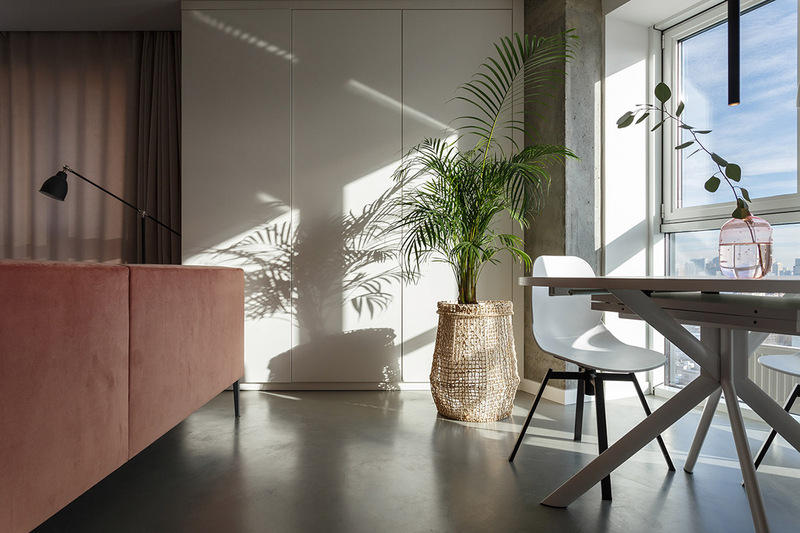 Indoor plants breathe life into the city flat. One large specimen softens the look of a raw concrete column; its rattan planter adds extra warmth and texture to the scheme. A single sprig of greenery extends from the dining room table centrepiece. Wood effect cabinets have been banked to one side of the white kitchen to warm the look through. 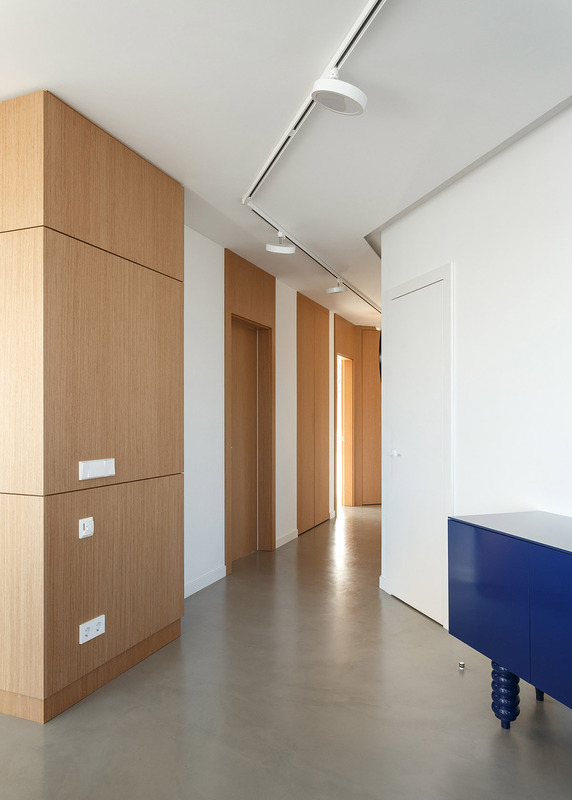 Interior doors & surrounds in the hallway are finished in matching material, which creates nicely spaced ‘stripes’ down the length of the hall. 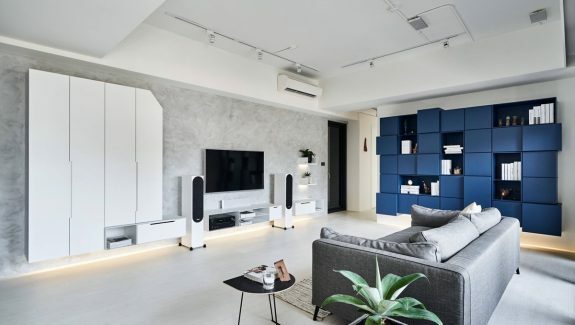 A deep blue console unit sits below a wall mounted tv, inspired by blue skies. 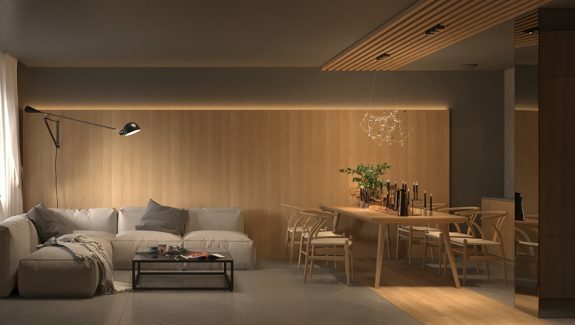 Above the dining table, a skinny pendant light descends almost unseen. 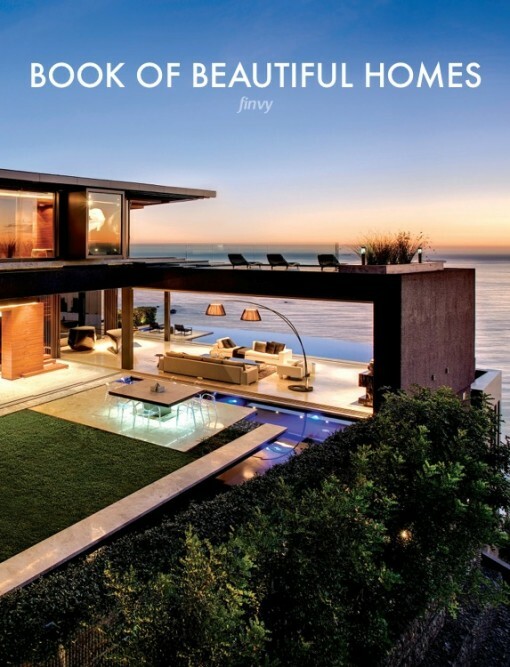 Its slender profile allows the window view to remain unobstructed. Blush coloured curtains pool at one side of the glass, waiting to be drawn come nightfall, or to filter direct glaring light during the sunset. 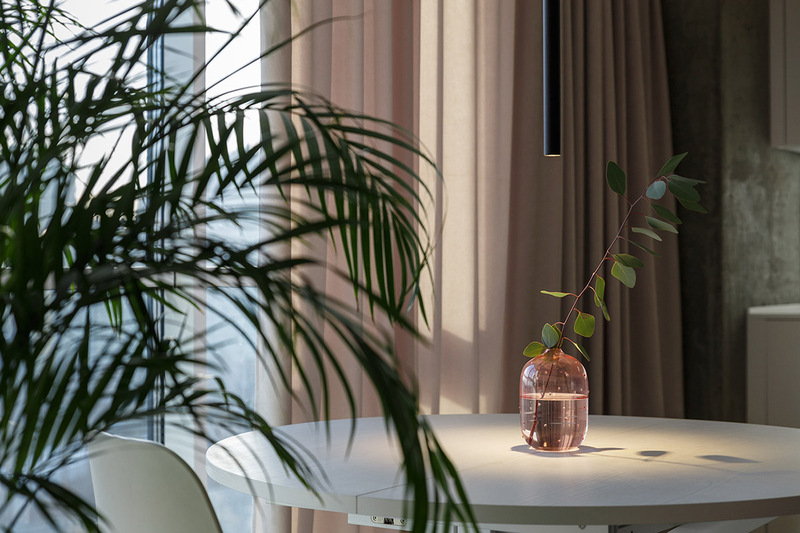 The decorative vase used as a table centrepiece complements the soft tone of the drapes. 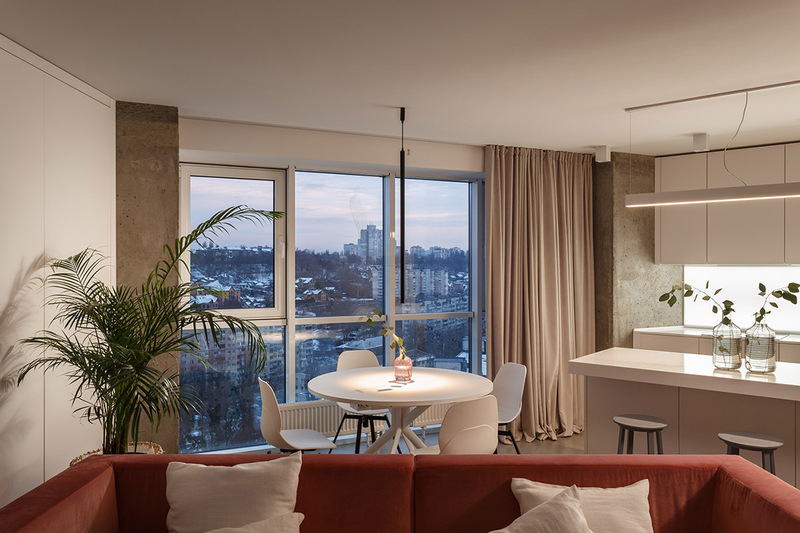 Concentrated light pools in the middle of the round dining table from the tubular modern pendant above. 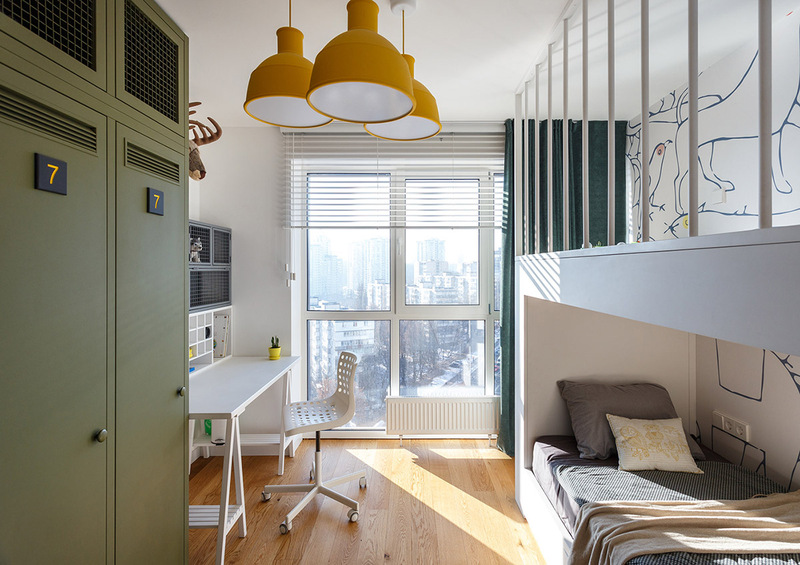 The pentagonal shaped room creates interesting angles in the layout. 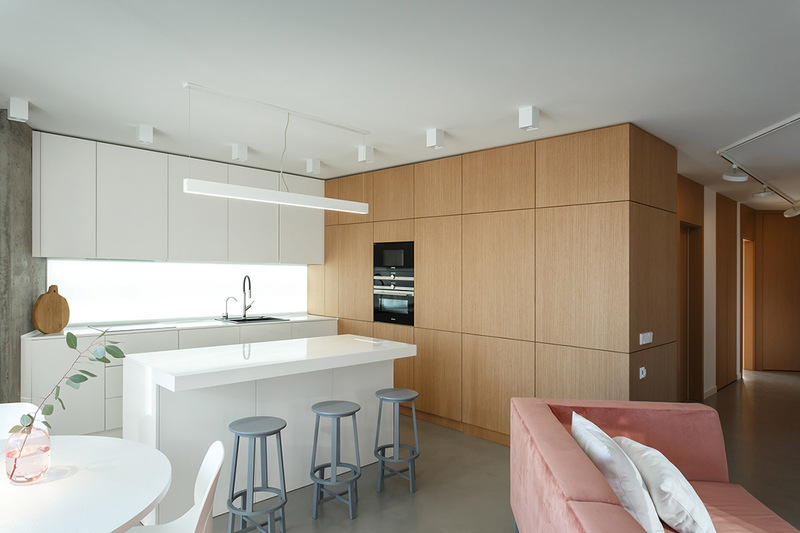 A white and wood kitchen occupies the two final walls of the room. 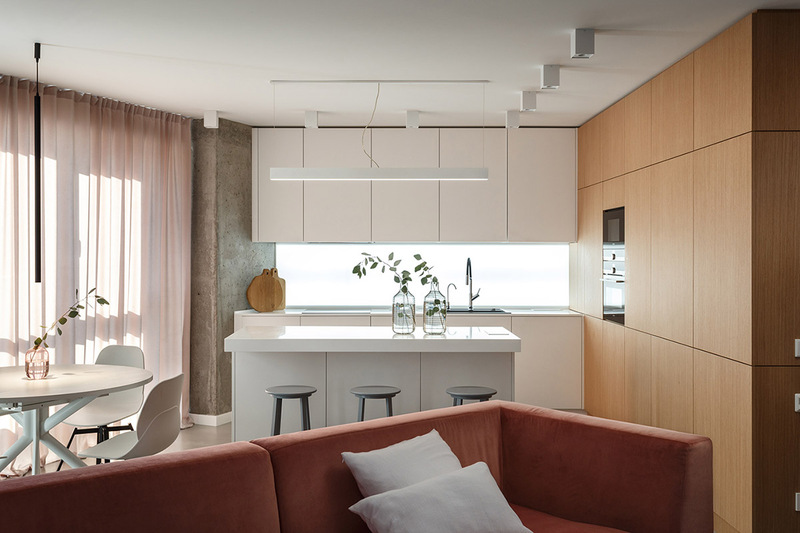 A linear light spans the length of a white island, where three grey kitchen bar stools stand poised for breakfast. 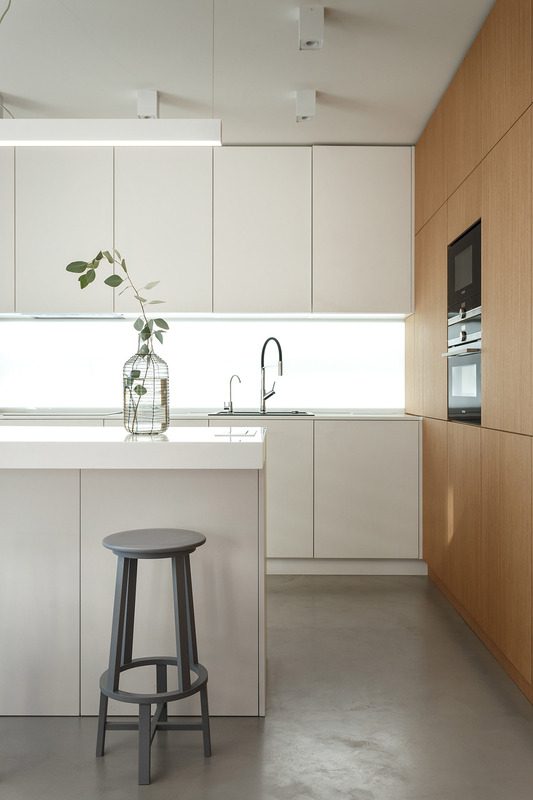 Another decorative vase with a minimalist sprig of foliage adorns the countertop of the kitchen island. 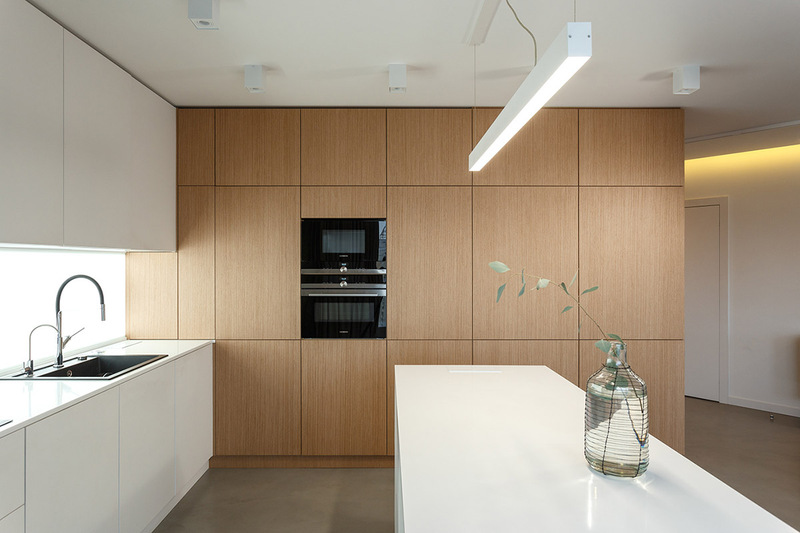 Tall wood effect kitchen units and smaller white cabinets meet sharply at one corner of the room. Neither colour bleeds into the domain of the other. 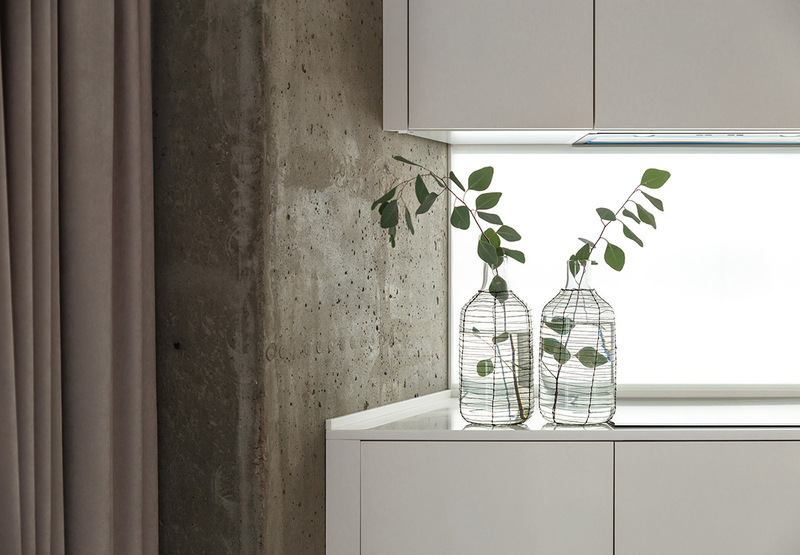 The sleek white gloss kitchen finish contrasts against the raw concrete window wall. Modern repositionable track lights zig-zag the ceiling. 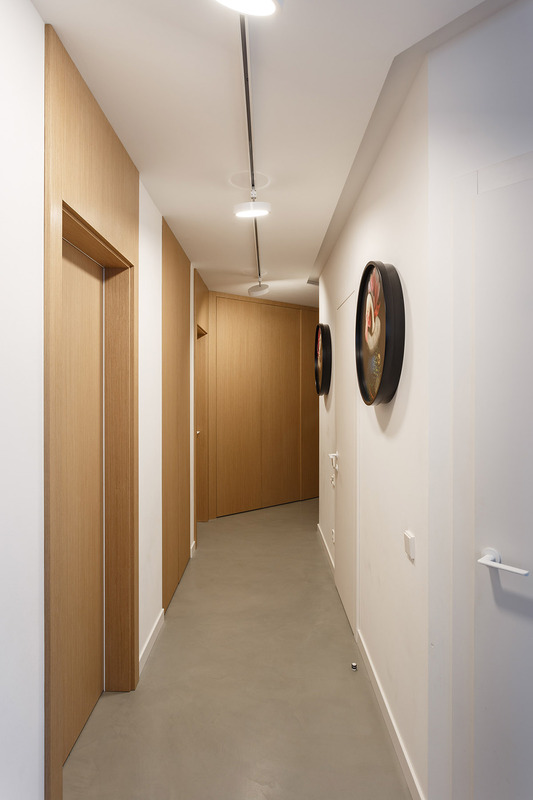 Whilst the doors on one side of the hallway (leading to two kids’ rooms and two closets) are all wood panelled, the interior doors on the opposite side (to the master bed and family bathroom) are pure white to keep the look streamlined. 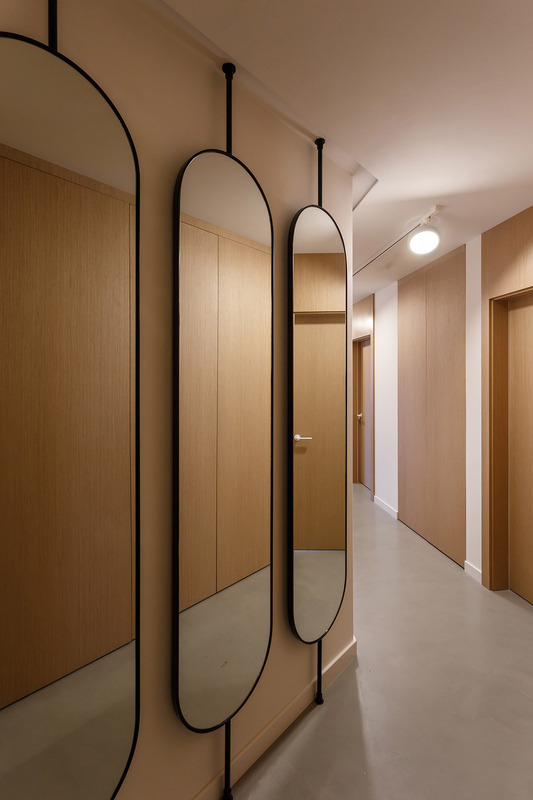 Elliptical mirrors help to create a sense of light and space in the windowless hallway. A mirror ball plays with the light here too. 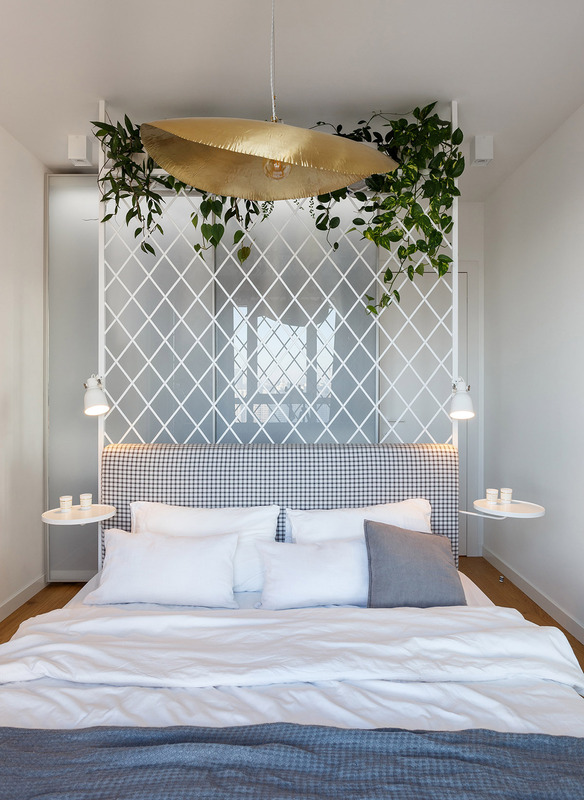 In the master bedroom, a bespoke headboard wall divides the sleep space from the dressing area, with white sconces and bedside tables attached to either side. 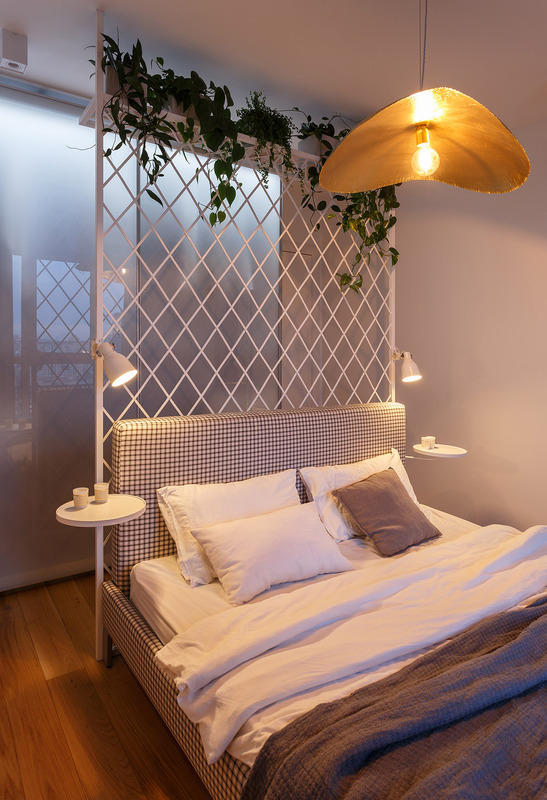 The bed is oriented toward the windows so that the homeowners can watch the dawn. 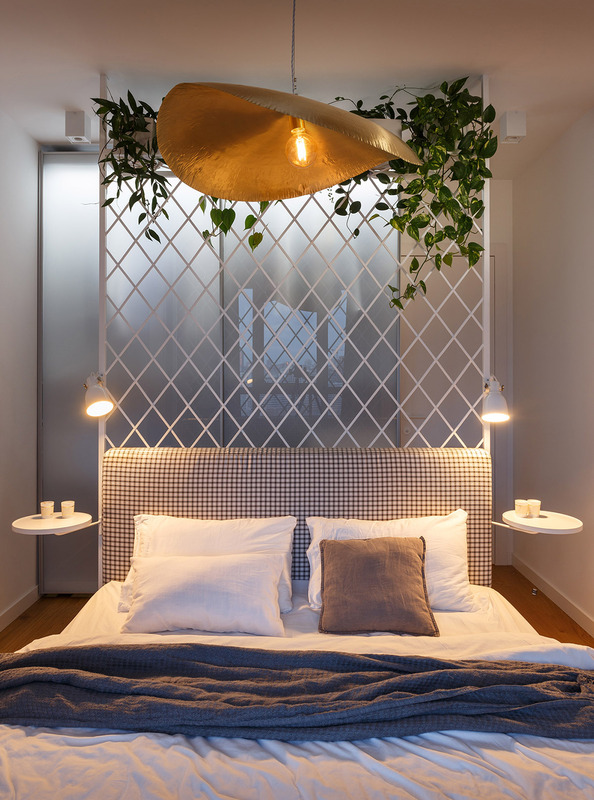 A golden bedroom pendant light shade shimmers above the blue and white bed set. 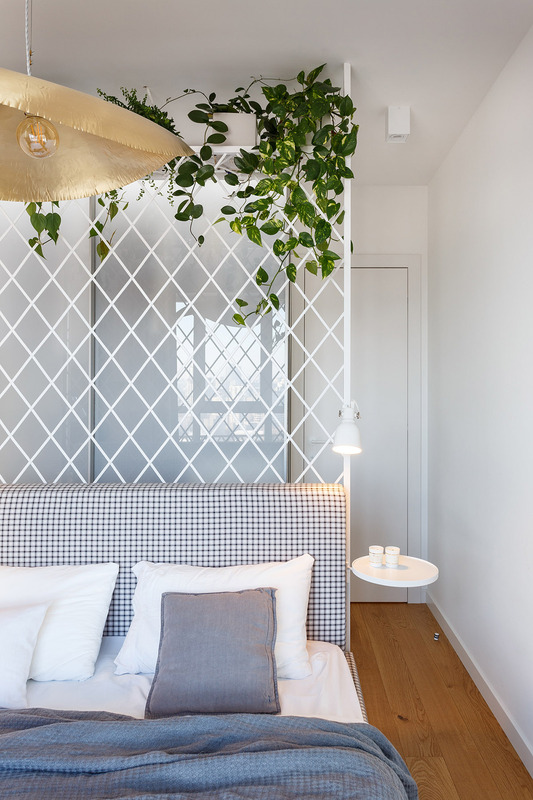 Trailing plants flourish on top of the bedroom divider. Blue gingham upholstery gives the bed a fresh and homey appeal. 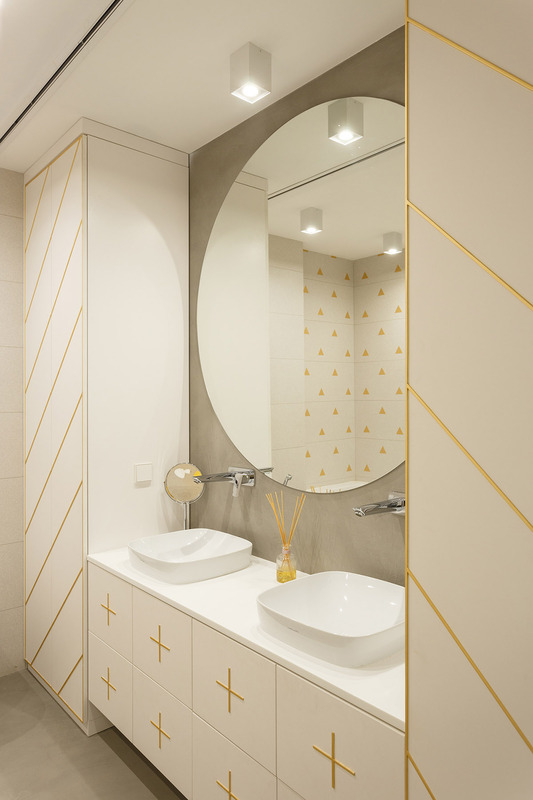 A double sink bathroom vanity unit and storage cabinets have been trimmed with yellow gold accents that cross and stripe their way across white slab doors and drawer fronts. 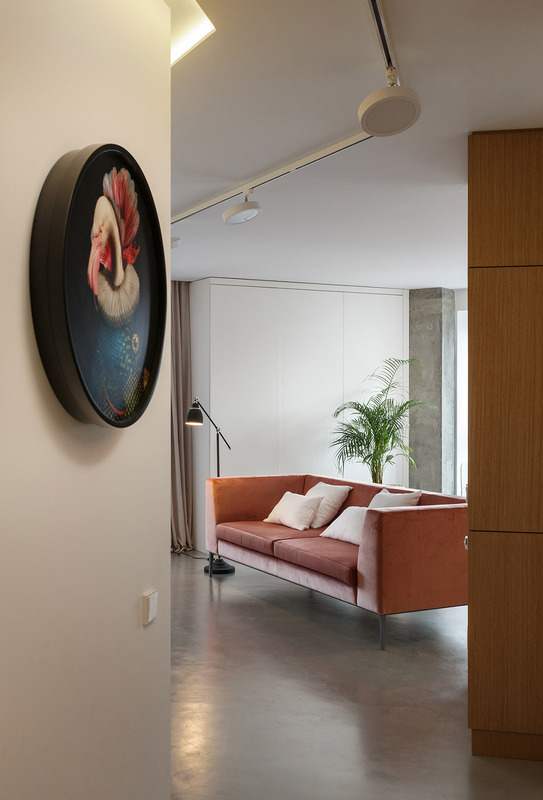 A huge round mirror hangs on a concrete wall. Tiny triangles pattern a tiled wall on the opposite side of the room. 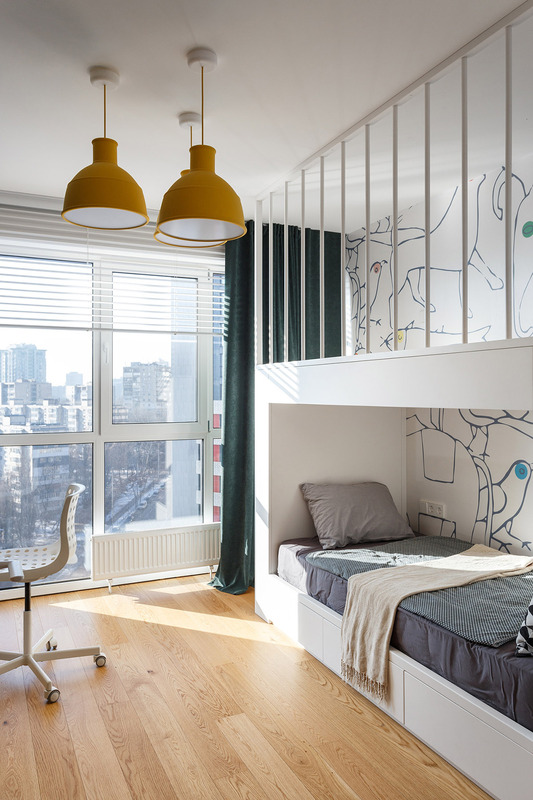 In the first kids’ room, a trio of yellow Muuto Unfold pendants bring sunshine to the ceiling. 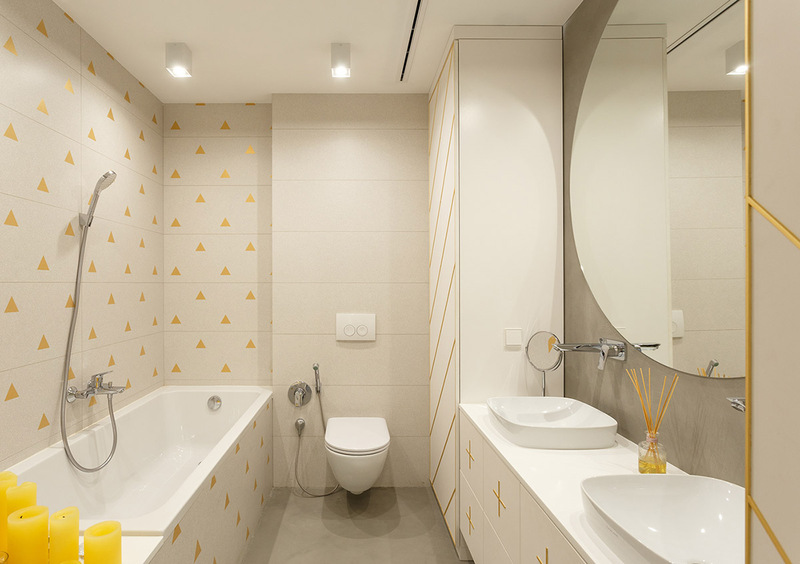 An animal themed wall adds small splashes of bright colour to the mix. 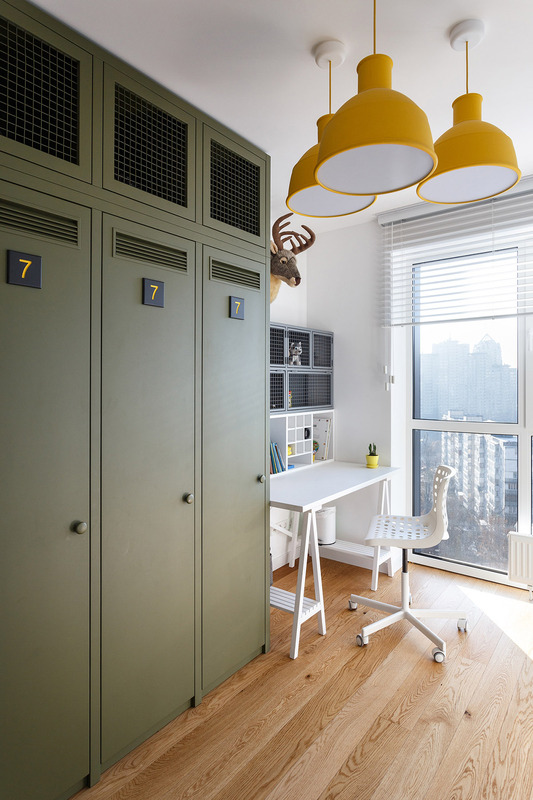 Muted green lockers provide closet storage. 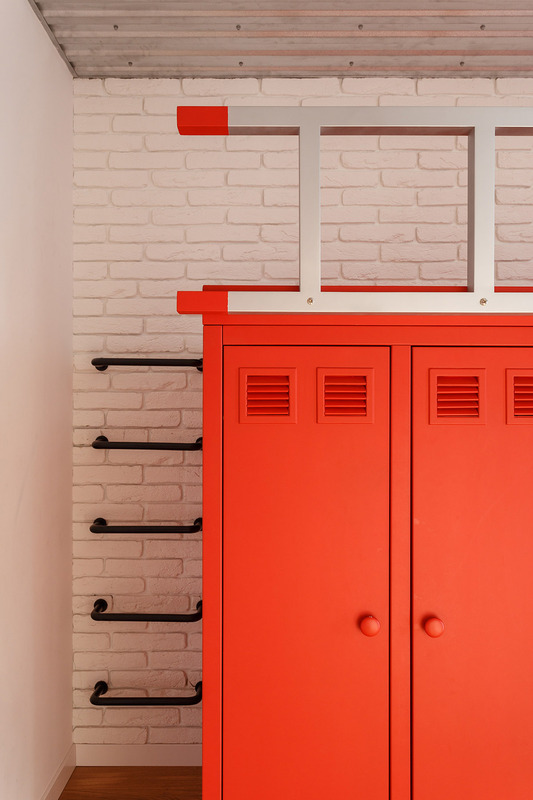 Mesh lockers above the closets and some above the kid’s desk are available for storing smaller items. 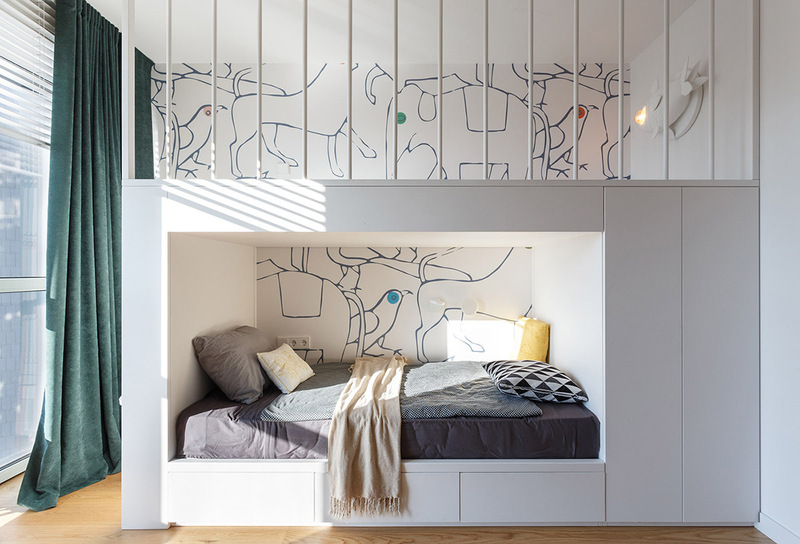 The built-in kid’s bed has an extra bunk, a set of drawers and another closet amalgamated into its design. See more kids’ beds ideas here. The second kid’s room is a bright red and white decor scheme. 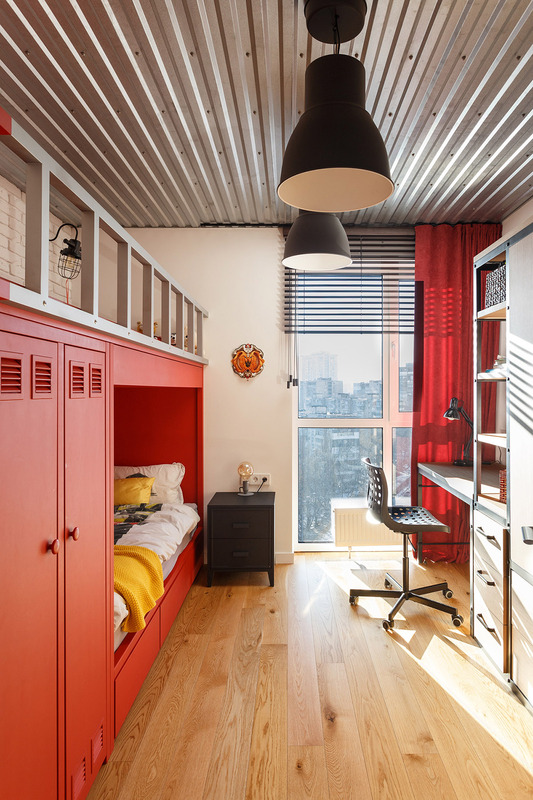 Locker style doors are set into a custom bed design that resemble a firetruck, with a silver ladder rail providing safety across the top bunk. Corrugated iron spans the ceiling like a shutter door. A red curtain dresses tall windows by the desk. Black ladder rungs climb a white brick effect wall. 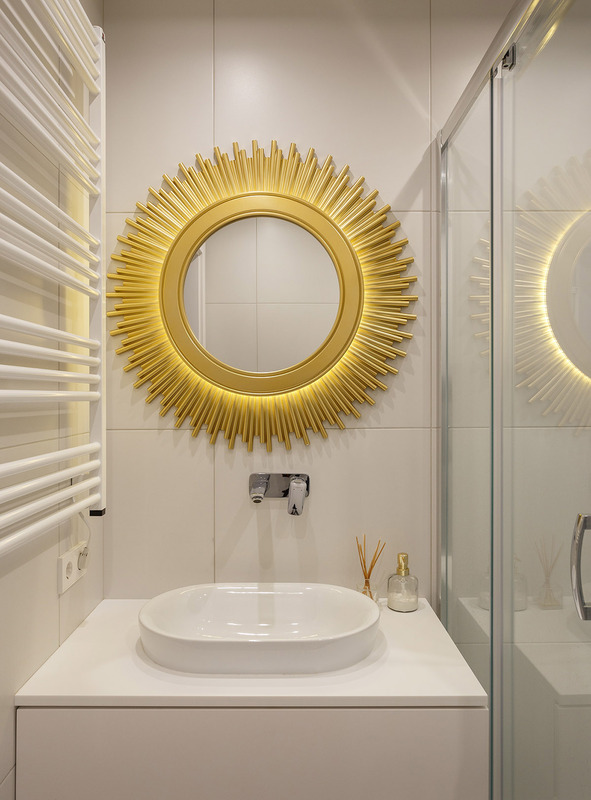 The master bedroom features a small ensuite shower room, where a golden vanity mirror shines like the sun. 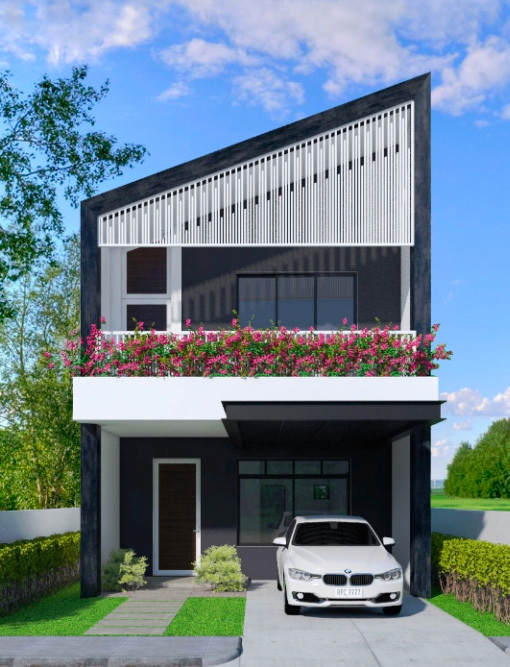 This home plan better shows the challenging footprint of the flat. 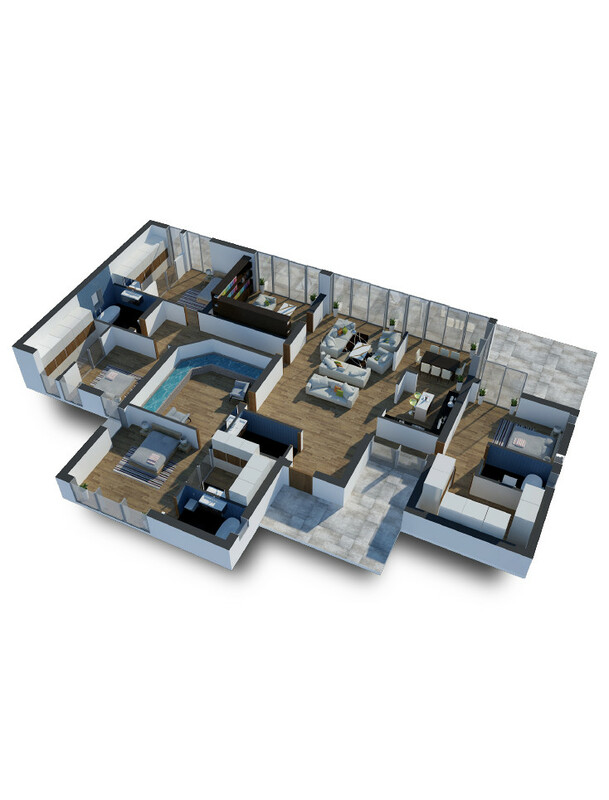 Here we can see the hexagonal living room that houses the lounge, kitchen and dining room areas. 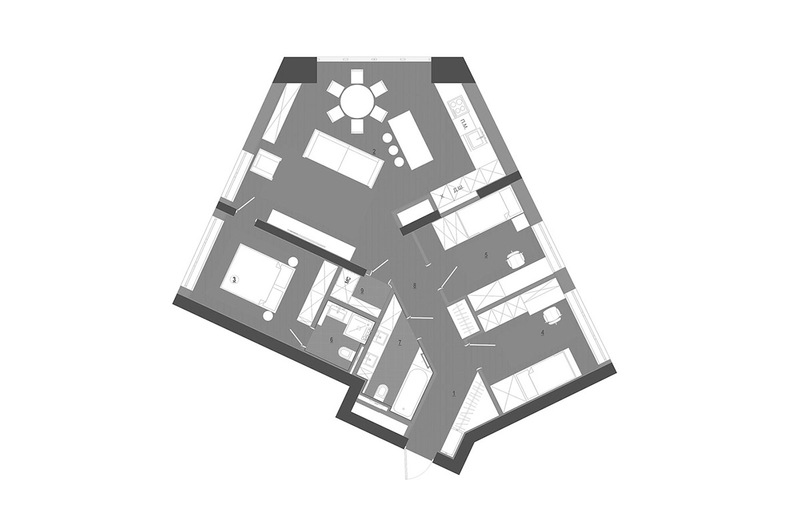 The plan also reveals the trapezium shape of the family bathroom.